Richard Pachter: What Would Google Do? Author Jeff Jarvis suggests embracing the Internet monolith so that you, too, can rule the world — maybe. What Would Google Do? Jeff Jarvis. HarperCollins. 224 pages. Unless I missed an earlier one, this is the first religious tract about Google. Jarvis, a high-profile blogger, journalism teacher, entrepreneur and editor preaches that with few exceptions, businesses ought to embrace and embody the qualities that he calls (ugh!) ''Googley.'' Essentially, this involves total transparency and user empowerment through blogging, Facebook, Twitter and other Internet conveyances. For many industries, following Google's lead is a great idea. As detailed in numerous books, aggregated intelligence is a powerful force and by enabling it, businesses can enhance and accelerate product development, marketing and other vital functions. It's also an ideal way to handle customer support and service. Jarvis cites his own case of being burned by computer manufacturer Dell and his subsequent (and oft-linked) blog posts, which he humbly suggests might possibly have contributed to the company's fall from grace (and profits). He followed up with measures to address his concerns and prevent others from suffering as he did. Ultimately, Dell adopted a number of Jarvis's ideas, though he extravagantly disavows any responsibility for their implementation. Ironically, Google itself largely fails to embrace the transparency Jarvis says is so vital. The company, he writes, ''is as opaque and as secretive as the Pentagon.'' Guess Google isn't sufficiently ''Googley,'' according to its acolyte. Beyond the Dell episode, Jarvis goes from industry to industry (retail, banking, real estate, insurance, manufacturing, etc.) proposing various ways each can become ''Googlier.'' Jarvis is fearless in his pronouncements in spite of any residual unfamiliarity with the actual needs of each segment. He's on the side of the consumers, after all. For the most part, his lack of expertise is not a problem, though his invocation of Howard Stern as a marketing model is rife with flaws, especially given the King Of All Media's current diminished influence. Jarvis was apparently traumatized by incompetent and dishonest real estate people, and he is admittedly unaware of the value of working with dedicated professionals. He advocates a number of dramatic measures to eliminate that industry's present structure by replacing it with online (and offline) services. While he offers many good ideas, his pontifications are markedly harsher here than in other sections, reflecting, perhaps, his personal angst. Jarvis also touches upon Google's maxim ''Don't be evil,'' and mentions their contrary cooperation with Indian and Chinese government authorities that resulted in arrests of democracy advocates. He also mentions Google's advertising practices and their mysterious search algorithms that can fatally affect customers and competitors. But there's only slight discussion of Google's accumulation of personal information, which it uses as part of its aggregation of searches to improve its efficacy and business opportunities. An investigative journalist I recently spoke with expressed concern with what the company was doing -- and could do — with the data. Jarvis is willing to give Google the benefit of the doubt, based on, well, it's not exactly clear; faith, perhaps. 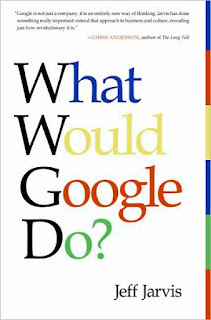 On the whole, "What Would Google Do" is more of a ''What can I do?'' exercise. Jeff Jarvis may not be quite as omniscient as he imagines, but his bold thinking and prodigious faith results in a rollicking sermon on reinvention and reinvigoration. Thanks for the review - I like the sound of this book. Being down my alley, I might just give it a shot.